Some people seem to excel in ineptitude. 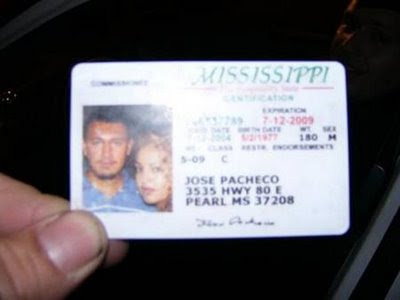 Example 1: alias Mr. Jose Pacheco created this false Mississippi driver's license. He apparently was unaware that a license normally would not have the picture of the licensee's girlfriend too. Example 2: This week an 18-year-old Swedish man was arrested for forgery and using a falsified ID. He was trying to gain access to a pub in Malmo, when the guards noticed that the ID didn't look quite right. The man confessed to using a scanner and color printer to created the false document. He altered the birth date on the new document. He was caught passing the doctored document. He was serious about using it. He confessed to making and using the document. Why then, were all charges against him dropped? It seems that the "counterfeit" job was so poorly done and the document looked so fake that the court ruled that no one who looked at the ID could possibly have been fooled into thinking that it was real. That is, except for the guy who made it. He was set free and was not charged with anything. If he had been convicted, he would have faced a possible 6 months in prison. Ineptitude has it's perks.